No disrespect to John Carpenter, but it’s hard to think of a movie that better captures the spirit of Halloween than Michael Dougherty’s superb anthology TRICK R TREAT. At times this film has an almost childlike sense of magic, mischief, and fun. But just like the pagan holiday it celebrates, beneath TRICK R TREAT’s harmless looking surface lurks death, nastiness, and horror. A healthy dose of black humor and poetic justice straight out of horror comics like Tales From the Crypt ensures that the witch’s brew isn’t too bitter. It’s not so much scary as it is fun in the same macabre and grisly way that urban legends and campfire horror stories are. Comparisons to the eighties horror anthology CREEPSHOW are not entirely unfounded, but aside from the opening credits the tone is less one of overt comic book homage and more dark fantasy. 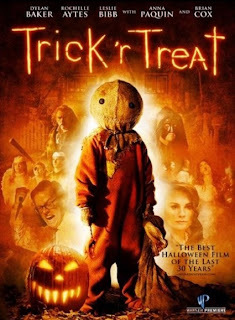 Unlike most horror anthologies, TRICK R TREAT has no distinct framing sequence or host character. There’s only the mysterious trick or treater Sam (Quinn Lord), who wears a burlap sack with button eyes for a mask. He's always lurking somewhere in the background of each story, only taking center stage for the final segment. What ties the film together is that all the stories take place over the span of a few hours one Halloween night in the town of Warren Falls, OH, though we don't see them play out in strict chronological order. Characters featured in one segment pop up as supporting players or cameos in others, in some cases after we’ve already witnessed their demise. It’s kind of like a horror PULP FICTION, with asides about Halloween traditions replacing Tarantino’s pop culture references. Busy character actor Dylan Baker probably gets the most screen time of anyone in the cast (other than Sam) as Steven, a school principal with more than a few dark secrets. Other familiar faces include Brian Cox as a mean old man who chases away trick or treaters and is just begging for a come-uppance, Anna Paquin as a shy young girl hoping to find the right guy for her “first time”, and Battlestar Galactica’s Tahmoh Penikett as a Halloween loving husband whose wife doesn’t share his enthusiasm for the holiday. There’s also an assortment of fine child actors, some of whose characters meet unpleasant ends. If kiddie death in a movie bothers you, even one as obviously a fantasy as this one, consider yourself warned. For an anthology film, TRICK R TREAT is surprisingly cohesive and consistent. No doubt everyone will have their favorite segments, but the whole actually adds up to more than just the sum of its parts. This film had only a limited theatrical run, mainly at festivals, while countless mediocre and downright bad horror films played in multiplexes everywhere. Sadly, that's what happens to most modern horror films these days that don't have marketable stars and/or aren't sequels or remakes. Regardless, TRICK R TREAT is now available to watch at home, and horror fans are well advised to check it out lest they anger the Halloween spirits.